WINSLOW -- Braley Leadbetter scored on a breakaway in the second overtime as the Mt. 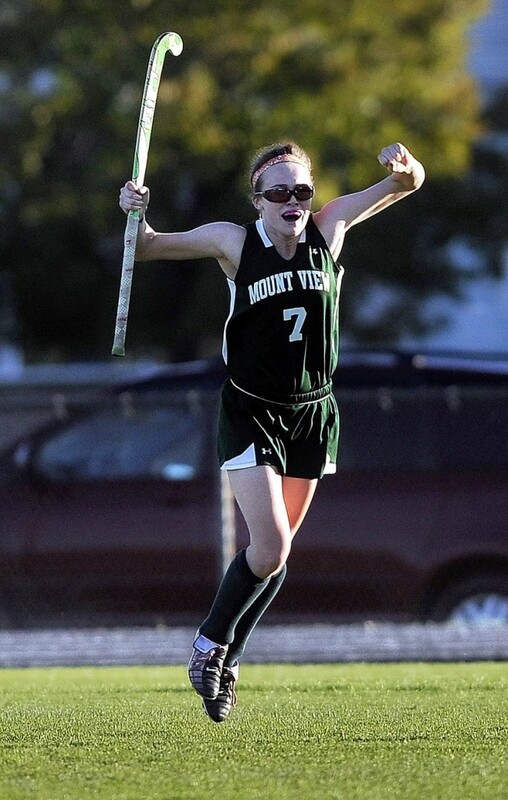 View High School field hockey team avenged a regular-season loss and beat Winslow 2-1 in an Eastern A quarterfinal game Wednesday afternoon. WINSLOW — Braley Leadbetter scored on a breakaway in the second overtime as the Mt. View High School field hockey team avenged a regular-season loss and beat Winslow 2-1 in an Eastern A quarterfinal game Wednesday afternoon. The fifth-ranked Mustangs improve to 11-3-1 and advance to play No. 1 Belfast in the semifinals Saturday. No. 4 Winslow ends the season 11-4-0. The Mustangs travel to Belfast on Saturday to take on the top-ranked Lions, who defeated Gardiner 3-2 on Wednesday. When these two teams met on Sept. 6, Winslow cruised to a 6-1 win. Since that loss, the Mustangs are 11-0-1. In the second overtime, Leadbetter found the loose ball near the Black Raiders’ end of the field. She proceeded to glide past two Winslow defenders in full sprint toward the goal, slipping a shot past goalie Alexis Lachance. The teams managed just four shots in a scoreless first half. Mt. View took the lead 15 minutes into the second when Brittany Masessa scored on a penalty corner on an inbounds pass from Andrea Smith. The goal gave Winslow a jolt and the Raiders put constant pressure on the Mustangs throughout the rest of the half. Winslow tied the game with three minutes remaining in regulation, when Jennifer Poulin was able to tip in a Bethany Winkin shot to tie the game at 1-1. Neither team gained ground in the first overtime until late, when Leadbetter got a breakaway opportunity, but was stopped by Lachance. Leadbetter got her second breakaway opportunity in the second half, and made the most of it. The Mustangs played to a 1-1 tie in the final game of the regular season against Belfast on Oct. 9. Mt. View outshot the Lions 23-4 in that game. Hewett said the win over Winslow will give the Mustangs confidence heading into Saturday’s game.